Each week, Big Issues focuses on newly released comic books of significance. This week, it’s Hellboy In Hell #10. Written and drawn by Mike Mignola (The Amazing Screw-On Head, B.P.R.D.) with colors by Dave Stewart (B.P.R.D., Fight Club 2), this issue serves as an exceptional conclusion to the Hellboy saga that has unfolded over more than two decades. Hellboy In Hell #10 may not be the last Hellboy story, but it should be. Mike Mignola is ending the series so he can pursue painting for at least the next year, but there’s no need for him to return to his signature creation after this issue. Hellboy has finally found peace after a lifetime (and afterlife) at war, and while Mignola rushes to get Hellboy to that point in this conclusion, the cartoonist finds a way to make that abrupt, quick pacing work for the story. Hellboy In Hell was originally intended to be a book where Mignola could tell smaller stories driven by whatever creative impulses he was feeling in the moment, allowing him to create strange, abstract narratives and visuals that were deeply personal. Not necessarily personal in an autobiographical sense—although there are moments where Mignola comments on his career via Hellboy’s infernal journey—but personal in that he isn’t trying to satisfy anyone’s need but his own. Plans change, though, and Mignola is responsible for forging the chains that prevented him from continuing down the path he initially wanted for the title. 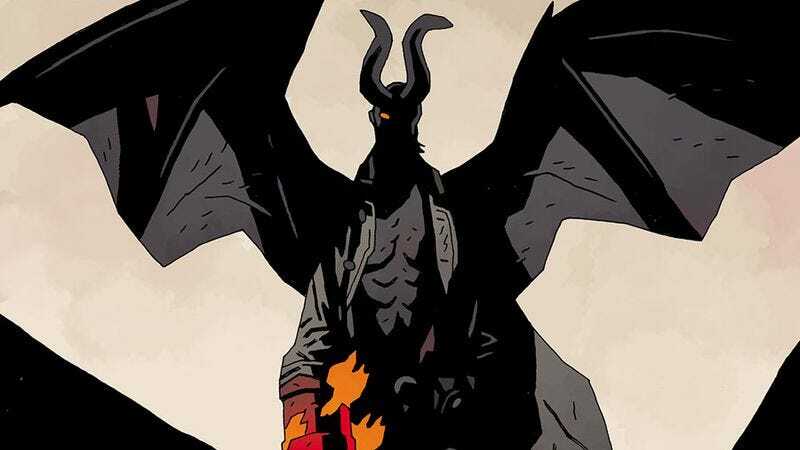 The killing of Satan by Hellboy’s hand and hell’s subsequent descent into chaos was too big a plot to ignore, but it also wasn’t what Mignola wanted to focus on with this series. “Right now this feels way too much like that life I left behind,” Hellboy says in last month’s Hellboy In Hell #9, and it’s hard not to read that as Mignola’s opinion of where he’s ended up with this title. The book began as a place where Mignola could do things like a gothic puppet-show version of A Christmas Carol, but he ended up back at Hellboy fighting demons and confronting his apocalyptic destiny. That doesn’t interest Mignola much anymore, so rather than continue working with these self-imposed constraints, he decided to wrap up the story. Hellboy In Hell #10 details the climactic moments of Hellboy’s battle against the dominant forces of the underworld, but these events aren’t depicted from the main character’s perspective. Rather, they’re recounted by a demon that last appeared in Hellboy In Hell #5, who tells his grandmother of the epic annihilation he witnessed from Beelzebub’s castle, the last refuge for the old guard of hell. Mignola’s rapid pacing of the story gives this recounting a frantic, breathless energy, but he takes a brief moment at the start of the issue to set a gloomy, ominous atmosphere before jumping into the bombastic action. In the first three panels, a skeleton recounts the most famous passage from John Donne’s Devotions Upon Emergent Occasions as he looks out from a window in a bleak gray city. Shortly after the skeleton reaches the issue’s title, “For Whom The Bell Tolls,” the demon storyteller flies into the narrative and crashes into the bell that signaled Hellboy’s last course of action, landing in front of his grandmother who is ignorant of recent happenings. Dave Stewart’s almost exclusively gray color palette immediately establishes hell as a cold, lifeless environment, setting a strong point of contrast for the rush of hot orange and red that appears in the artwork when the story jumps back to show Hellboy’s assault on Beelzebub’s castle and his fight against the Leviathan and Behemoth. It does feel like there’s a missing chapter between the ending of last issue and Hellboy’s appearance as a gigantic flaming being that towers over the mountains of hell, but that hole puts the reader in a similar position as the demon witness. Beelzebub tells his followers that he’s going to summon their brother Pluto to relight the flames of hell, but doesn’t get the opportunity to put this plan into action before the kaiju Hellboy appears. Just as Beelzebub’s plan is cut short, so too is Mignola’s plan for this series, and while he could have continued to explore this world with this greater conflict in the background, he does what he’s been doing the entire time: He follows his instincts. That instinct is telling him to end the book, and while he has to take some shortcuts to get there fast, he manages to use those shortcuts to imbue the issue with a sense of mystery rather than laziness. It helps that the mystery has been a constant through-line for the series, and Mignola has been very careful to give readers tidbits of information that invite personal interpretation rather than breaking down every detail of the story. Hellboy In Hell can be a challenging read for people whom aren’t familiar with Mignola’s work, but as mentioned earlier, he’s not aiming for mass-market commercial success with this book. He’s not trying to make something that will appeal to everyone; he’s making something that appeals to him. That may be self-indulgent, but that’s not a bad thing in this case. Mignola’s spent years sharpening his craft as a cartoonist and building an audience that admires his unique aesthetic, and it’s been fascinating to see him experiment on this title. Every issue is packed with intriguing ideas and bold, immersive visuals, and even as the book moved in a different direction than Mignola intended, his passion for the material never wavered. There’s a palpable excitement in the pages of this issue, particularly the ones that see Mignola doubling down on his Jack Kirby influence when Hellboy takes action in a massive kaiju battle that shakes hell to its core. Mignola’s talent for dramatic composition is highlighted by the striking shots of Hellboy approaching Beelzebub’s castle and his ensuing fight, and Stewart’s fiery coloring gives this sequence a raging intensity that doesn’t subside until Hellboy stands victorious. At that point the gray palette returns, drawing extra attention to the orange Crown Of The Apocalypse that now sits between Hellboy’s two horns. But as readers of Hellboy’s adventures already know, he has no interest in wearing that crown and bearing its responsibility. He breaks off those horns and returns to his old form, finally freed from the destiny that has weighed on him since his creation in the pits of hell. The final moments of the issue are left ambiguous as Hellboy takes one last trip through the desolate wasteland left in his wake before settling in a seaside home, but there’s an undeniable feeling of calm and peace. It’s still haunting because of how Mignola and Stewart capture Hellboy’s isolation in his now-desolate surroundings, but there’s a flicker of hope that arrives in the last two pages, implying that Hellboy has discovered a pocket of heaven by dismantling hell. Mignola has had a career trajectory that most cartoonists can only dream of, entering the industry at Marvel and DC, where he worked on characters like the Hulk, Rocket Raccoon, and Batman before creating his own, independently owned property that would bring him fame and fortune. Hellboy was a seed that grew into an entire line of comics, multiple movies (live-action and animated), novels, and video games, and unlike so many comic-book characters that have seen mainstream success, Hellboy is still owned by the man who created him. Mignola has been telling Hellboy and Hellboy-adjacent stories for 22 years, and despite the consistently high quality of those stories, the prospect of Mignola coming to a concrete conclusion for this world is very appealing. Endings aren’t something creators should be afraid of, and as Hellboy In Hell #10 shows, there’s immense beauty to be found in finality. There’s always the possibility that Mignola will return to the character and those stories may very well be compelling continuations of the mythos, but if this really is the end of Hellboy, it’s a powerful send-off that showcases the imagination, artistry, and freedom that have made this character such a remarkable presence in the industry.